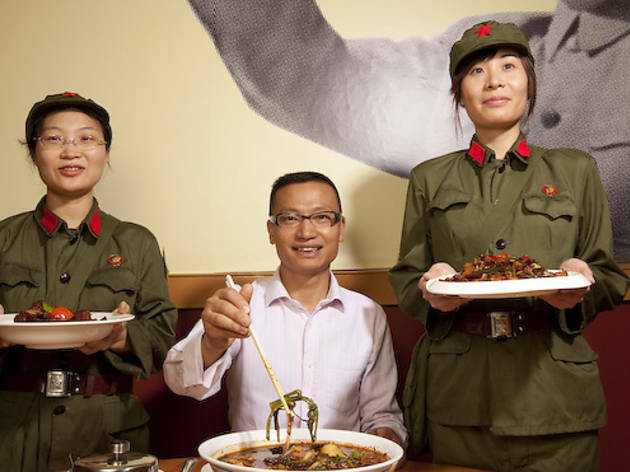 Chicago gets its first Hunan restaurant—and the first dedicated to Chairman Mao. Walking Chinatown’s two-block main drag takes Tony Hu a solid half-hour. A shopkeeper steps from his doorway to brag that this week’s frogs are even better than last. A local introduces her daughter, in hopes that Hu might have a server position for her. A beat cop thanks Hu for his birthday dinner at [node:176415 link=Lao You Ju;], arguably the most celebratory spot in Hu’s arsenal of five restaurants. After an initial pause to consider the restaurant’s theme, those familiar with Hu likely will focus on the menu. Like Chinatown’s popular Lao Sze Chuan, Lao Beijing and Lao Shanghai, Lao Hunan homes in on the cuisine of a specific region, this one known for its love of chili peppers, shallots and garlic, and for curing and smoking meats. This is intense food, spicy and oily and built around pork and chicken revered for good chew. “Home fed chicken” (roughly equating to free-range) is hung for two days to dry age before it’s lightly smoked over a wok filled with dry rice and spices. Hunks of tight meat are pulled and stir-fried with leeks, bell peppers, Chinese celery and a fistful of dried red chilies. Chef Fada Zhang, a native of Hunan, uses the same technique for his “famous Hunan preserved pork,” salting and hanging pork belly then smoking it over a fragrant haze of toasted dry rice, whole star anise and cinnamon bark. In contrast, cool, thin rectangles of “jade tofu” sit in a slick of chili oil with cilantro and scallions, while a pile of blistered peppers gain faint funk from fermented black beans.